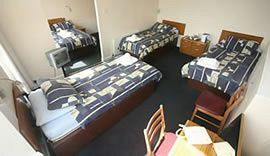 great value budget accommodation in the city centre. 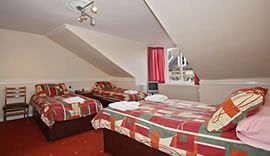 Single rooms from £22 per person. 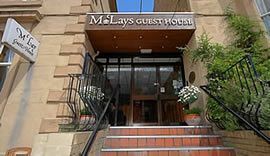 McLays' offers great value budget accommodation in the heart of the city centre. We are superbly located for visiting Glasgow's many museums and art galleries. 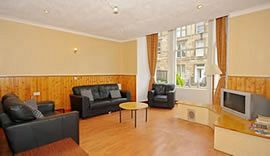 Just minutes away from Glasgow's finest shopping streets Sauchiehall Street and Buchanan Street, where in addition, you shall find an excellent selection of restaurants, cafe's, bars, cinema's, nightclubs etc. All the main transport points Glasgow Central Station, Queen Street Station and Buchanan Bus Station are easily accessible on foot. 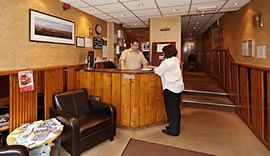 The guesthouse is located in the city centre, about 3 quarters of a mile from the main train stations (Central station and Queen Street station) and we are the same distance from the bus station, which is Buchanan bus station. You can walk to them all in about 15-20 minutes. If you have heavy baggage it's recommended that you take a taxi, as the walk is uphill!! We do not have a car park and parking is on the street only and is restricted due to our very central location. There is a voucher scheme in operation for parking and we can supply the vouchers for a nominal cost to enable parking. Pet Facilities: Pets are allowed. Guide dogs only. The best way to reach us from Glasgow Airport is to take a taxi direct. The cost is £20.00 approx. Alternatively take the airport bus to Buchanan Bus Station, cost is £3.00 per person, then from the bus station take a taxi, the cost is £4.00 approx. or it's a 15 minute walk. We are approx 25 miles from Prestwick Airport. The best way to reach us from Prestwick Airport is to take the train from the train station next to Prestwick Airport to Glasgow Central Train Station or to take the shuttle bus to Buchanan Bus Station. We are approx 15 minutes walk from both stations or 5 minutes by taxi. We are on the same street as Buchanan Bus Station at the other end of the street, approx 15mins walk. From Central Station we are 15mins walk, come out the main entrance, turn left and walk up Hope Street, at the top of the hill then turn left into Renfrew Street. From Queen Street Station we are 15mins walk, come out turn right and walk to Hope Street, head up the hill and turn left into Renfrew Street.